I feel like this is recipe I have been waiting for my whole life. Seriously, I think I need some kind of award–maybe a unicorn sticker–that says “I made Unicorn Popcorn.” Pretty much the coolest food ever to pass my lips. I mean–UNICORNS MADE IT. Wait, that’s kind of an exaggeration. There weren’t actually any unicorns involved in the making of it. My bad. Heh. Well, regardless of my little faux-pax of exaggeration, this Unicorn Popcorn is absolutely awesome. No exaggeration there. If there was a sticker, I’d seriously deserve it–and I’d wear it proudly. It’s like a geeky teenager’s funnest snack-dream. I’ll have to make it–well, I suspect I’ll be making it for every event. No jokes. Because it doesn’t just have to be unicorn-flavor, it could be ANYTHING. 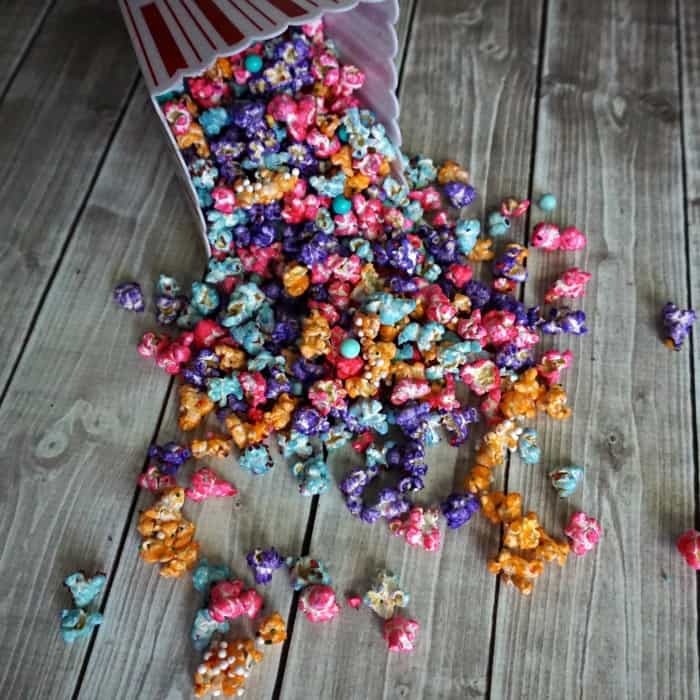 I could make…well, maybe I should hold my tongue and make a few recipes (like for Grape Popcorn, Strawberry Popcorn, Strawberry Shortcake Popcorn, and on, and on and on…EEEP!). Ok, in all seriousness, I totally think there will be other associated recipes coming to the blog soon–I can’t imagine my life with plain popcorn again. My kids are totally excited about it (we had to share it equally and there were little fights periodically as the baby snuck bites…it almost got ugly). I almost feel bad it took me so long to make this, they loved it so much. I mean, we did something like this when I was in elementary school–we had to invent a popcorn “flavor” and I went with something just like this. But, then the recipe just sat dormant on my brain…but apparently, it shouldn’t have. Because the kids…the kids LOVE it. 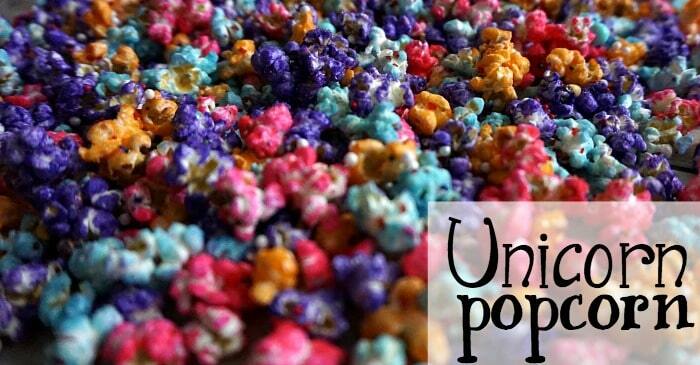 I think I need some kind of award--maybe a unicorn sticker--that says "I made Unicorn Popcorn." Pretty much the coolest food ever to pass my lips. Prepare as many sheets of aluminum foil on flat surfaces as you have food coloring options. Set aside. 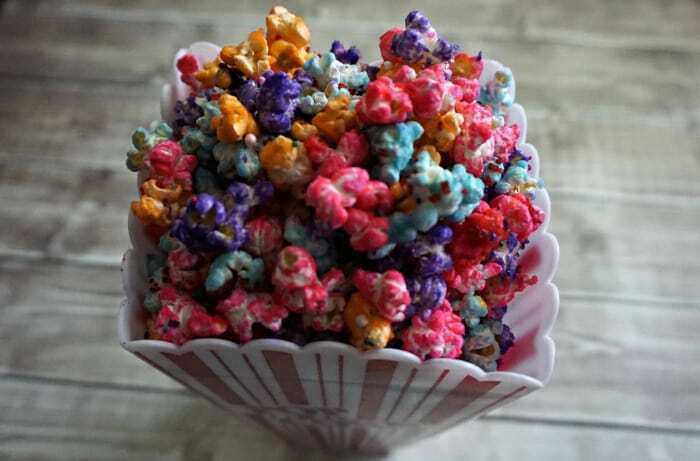 While you pop your popcorn, place your sugar, oil, water, salt and vanilla in a medium sauce pan over medium heat. Stir the sugar mixture until it's completely liquified. Separate the popcorn evenly into as many large bowls as you have food coloring options. Set aside. Separate the sugar mixture into as many small bowls as you have food coloring options. Add 5-8 drops of food coloring to each of the small bowls of sugar mixture and stir until the color is consistent throughout. 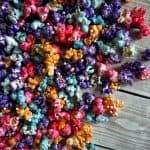 Pour one color of sugar mixture over each of the bowls of popcorn and stir, stir, stir until the color coats it completely. Repeat for each color. 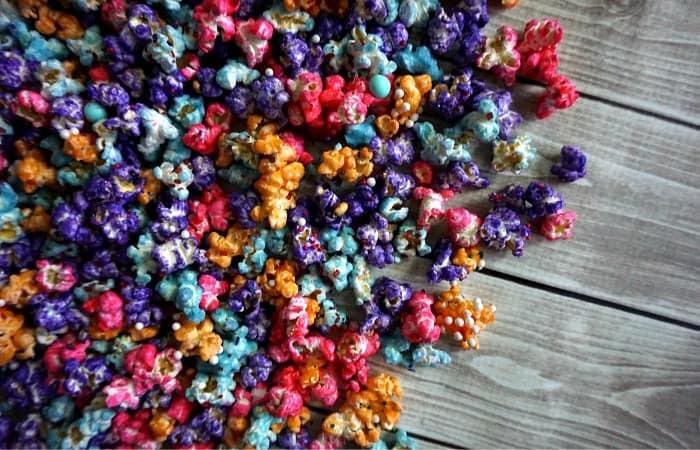 Spread each color popcorn over a prepared aluminum foil surface. Toss sprinkles of every kind over it before it dries. Allow to dry for at least 2 hours until no longer soggy. So, what do you think about my Unicorn Popcorn? Is this your new favorite, too? I mean, I hate having multiple new favorites in one week, but sometimes things just click. Want to see my other “new favorite?” Check out the Gluten-Free and Vegan Lemon Meringue Pie I made. I mean…it’s tough to have so many favorites…did I just make your situation hard, too? Heh.